An arabber (or a-rabber) is a street vendor (hawker) selling fruits and vegetables from a colorful, horse-drawn cart. Once a common sight in American East Coast cities, only a handful of arabbers still walk the streets of Baltimore. They rely on street cries to attract the attention of their customers. Holler, holler, holler, till my throat get sore. If it wasn't for the pretty girls, I wouldn't have to holler no more. Got 'em red to the rind, lady. During World War II, factory jobs opened to white laborers, leaving arabbing an almost entirely African-American vocation. By then, arabbing was already in decline, threatened by the expansion of supermarkets and the dearth of public stables. In the later 20th century, arabbers faced additional challenges from city zoning and vending regulations, and from animal rights advocates concerned about the health and welfare of the horses. In 1994, the Arabber Preservation Society was founded to help bring Baltimore's Retreat Street stable, which had been condemned, up to city building codes. The society continues to renovate and promote the preservation of the stables serving the remaining arabbers, who number fewer than a dozen. Besides providing a nostalgic glimpse of the past, arabbers still serve a practical purpose, bringing fresh produce and other goods to urban neighborhoods that are underserved by grocery stores. The documentary We Are Arabbers (2004), by filmmakers Scott Kecken and Joy Lusco Kecken, profiles contemporary arabbers. Arabbers appear in seasons 1, 4, and 5 of the television series The Wire, partly written by the documentary filmmaker Joy Lusco Kecken, who also wrote for Homicide: Life on the Street. On the May 5, 2009 episode of the television show Ace of Cakes, reference was made to an "arabber" carrying a customer around Baltimore in a coffin, as part of a living funeral. ^ McIntyre, John E. "You Don't Say: Baltimore words summed up - English grammar, language, usage and journalism blog". Weblogs.baltimoresun.com. Retrieved 2012-07-03. ^ "Arabber Quotes and Bibliography". Baltimoremd.com. 2009-01-23. Archived from the original on 2012-02-05. Retrieved 2012-07-03. ^ "Arabber Preservation Home Page". Baltimoremd.com. 2012-06-18. Archived from the original on 2012-06-04. Retrieved 2012-07-03. ^ McFadden, David, "2 old clans hitch horses together," Chicago Tribune, September 9, 2018, Section 1, p. 32. Associated Press (4 September 2018). 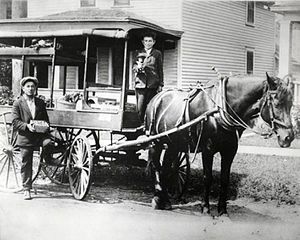 "Central Pa. Mennonites help Baltimore merchants with their horses". PennLive. Retrieved 4 September 2018. Bullock, Scott G. [Economic Liberty]. "Baltimore: No Harbor for Entrepreneurs". taxi-library.org. Institute for Justice. Retrieved May 30, 2009. Finn, Catherine (May 30, 2009). "The Wanderers' Songs". Preservation Online. "Arabber". BaltimoreMD.com. Arabber Preservation Society. Archived from the original on 2012-06-04. Retrieved 2012-07-03. This page was last edited on 11 April 2019, at 08:01 (UTC).